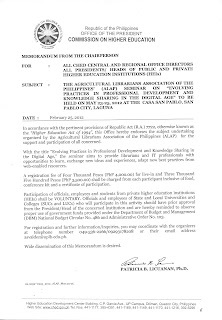 ALAP is the Agricultural Librarians Association of the Philippines. 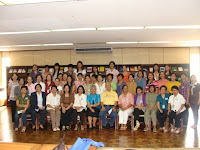 The group consists of librarians, information specialists, and other specialists working in agricultural institutions. It was founded on June 2,1972 with postal address at the University Library, UP Los Banos, College, Laguna. To increase the library’s collections despite the limited library funding, library managers, librarians and concerned individuals thought of maximizing the use of free resources available online. But questions arise, how do we gather free digital resources to augment our print collections? How do we systematically search, download, and share these reliable materials to our library users are common question to information professionals and researchers. Web harvesting, as we define it, is systematically searching, collecting and downloading free resources like e-books, e-journals, and other useful resources for access and use of our library clients. We have invited an expert to tell us more about web harvesting. More specific topics that our first speaker will expound are (1) strategies or techniques in selecting and gathering free (open access) online resources; (2) issues and concern (if there's any) in downloading and storing these files; and (3) how do share these resources with our library clients. Cloud computing is a very popular topic in information technology nowadays. "The basic idea of cloud computing is that your information is stored out there on the internet “somewhere”, available for you to access it whenever you want, from any computer." - http://idtheft.about.com. A Cloud Computing expert will familiarize us with what it is; (1) what are the examples of cloud computing; (2) what are the available free online data storage; and (3) how do we choose among the internet service providers if our library consider paid data storage and more. This forum is designed for Library Administrators, Information Managers, Librarians, IT Professionals and other interested individuals. global ‘lights out’ event on Saturday, 31 March 2012 at 8:30pm for one hour. 3. Campaign for Earth Hour 2012 to friends on facebook. Ten officers and members attended the Fellowship Luncheon and Celebration of Librarians’ Day on November 30, 2011 at the Hyatt Hotel, Manila. The event also marked the culmination of the National Book Week, which is celebrated on the last week of November. The Guest Speaker was Prof. Ambeth Ocampo, renowned historian, writer, and faculty member of the Ateneo de Manila University. Service awards were presented to past PLAI presidents, and Chairs of the National Book Week celebrations. Those who attended the fellowship luncheon and renewed ties with other librarians were Andriette Valdez (President); Elaine Joshi (Director), Lina Copioso (Treasurer), Lorenza Oliveros (PRO), Victoria Sandoval (Director), Imelda Veluz (Auditor) and members Mary Ann Ingua, Celia Dela Cruz, Carmelita Austria, and Mila Ramos. 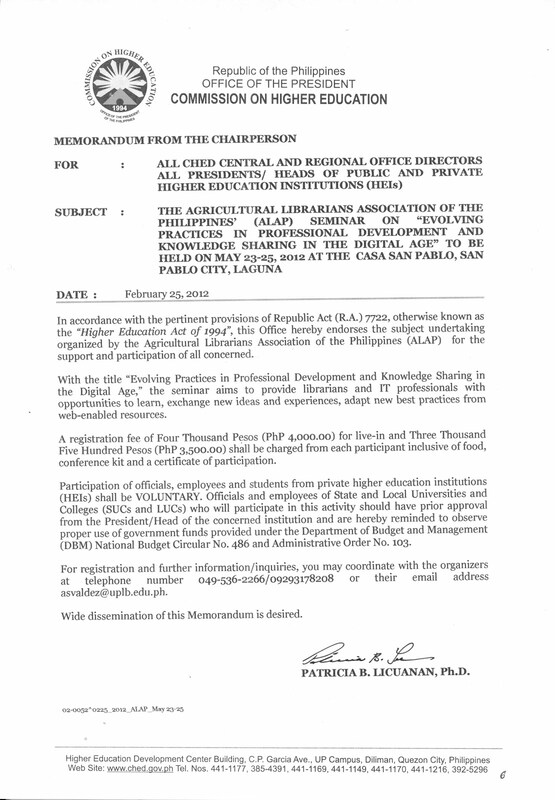 Greetings from the Agricultural Librarians Association of the Philippines (ALAP)! ALAP invites you to a seminar on “Evolving Practices in Professional Development and Knowledge Sharing in the Digital Age” on May 23-25, 2012 at Casa San Pablo, San Pablo City, Laguna. This activity aims to provide librarians and IT professionals with the opportunities to learn, exchange new ideas and experiences, adapt new best practices from web-enabled resources. The fee is P4,000 for live-in participants (inclusive of accommodation – May 23, 2012, check-in at 2:00 pm (NO dinner); May 24 to May 25, 2012 : registration; meals- am/pm snacks, breakfast, lunch and fellowship dinner; and kit. Live out participants shall be charged P3,500.00 (inclusive of registration; meals – am/pm snacks, breakfast, lunch and fellowship dinner; and kit. For more information and reservation , kindly contact Andriette S. Valdez (UPLB CFNR Library, email: asvaldez@uplb.edu.ph, or asvaldez1@yahoo.com, tel., (049) 5362266; cp: 09293178208 or Concepcion DL. Saul (UPLB Main Library), email: clsaul@uplb.edu.ph, tel. : (049) 53623-36; cp: 09178408010. Thank you very much. We look forward to seeing you in this seminar. ALAP gather yearly in the form of a forum or seminar to update its members with the latest trend in Library service and renew friendship and camaraderie among its members. 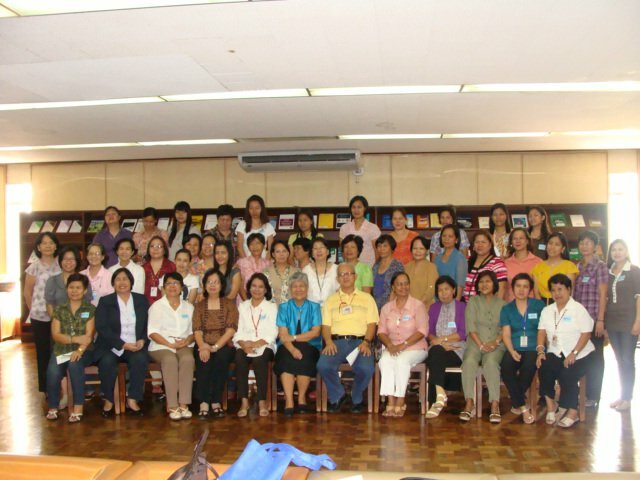 Last June 3, 2011, ALAP celebrated its 39th anniversary and general assembly with a forum “Communicating the Value of Libraries and Librarians” at the University of the Philippines Los Baños Library, College, Laguna. Dr. Rita P. Laude, UPLB Vice Chancellor for Instructions delivered the welcome address. She was happy that ALAP is very active in improving the quality of agricultural library services in the country and hopes that the Association will not supper the mid-life crisis as it approaches its 40th anniversary. Resource speakers were : Dr. Delfin C. Suministrado, UPLB-CEAT Professor and Director of AMTEC with the topic “The value of libraries and librarians in the new information environment from the stakeholders’ point of view”, and Hon. Mila M. Ramos, Member, Board for Librarians who talked on “Library marketing: selling your library’s value in the digital age”. The general assembly followed after the forum. Ms. Concepcion DL Saul, 2009-2010 President reported her term accomplishments and Ms. Lina Copioso, Treasurer, presented a financial report.